General information: Was the Platinum Bar for a while but has now reverted to previous name. Just posted this comment on an another site ..thought I'd repost and update it. AnnaBanya ...is that the Anna I know and love? 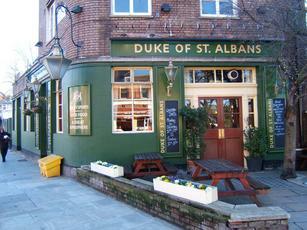 I was a regular in the Duke from 1988 till 2004. From 1988 till circa 1994 it was a fantastic pub. It had a great community spirit and everyone was made to feel welcome. It was an �old school� boozer with a pool table, dart board and jukebox. The rot set in when Grand Met Leisure(Chef & Brewer), who owned the Duke, sold all of their pubs to Scottish and Newcastle. Prior to the Scottish and Newcastle buy out, the Dukes managers were on �Barrelage� the more beer they sold the more money they earned. The food (although it wasn�t to Gordon Ramsey standard...far from it) was also an added bonus to the manager. From 1993 to 2004 the Duke had 15 managers and a various drug related problems..., this is never a good omen for a public house and it spelt the death nell to a once up and coming north London pub. Add to this the changing face of London...and its gentrification and the writing was on the wall for the Duke! It�s a classic example of what happens when a large brewery takes over a pub and listens to accountants and not its patrons. Jane Simonds and her family, Ex Duke manager. Tom and Mary, Ex Duke managers. Doom and Gloom, Ex Duke managers. Norman, we loved you man. Simon the green grocer. One of the nicest human beings I ever met. Curtis and Gemma... were you just a dream! And all the rest of the wonderful personalities I met over the years! In the 80's The Bud was ice cold and imported. In the 90's the Molsen was cheap and chilled. A good pint of IPA,London Pride etc does not make a good pub ..... a great comunity makes a good pub! A continental restaurant has opened up on the site. As such, it is open only to diners. This is sad, and represents a loss of amenity to the immediate neighbourhood. Up until the early 1990s this was a good community pub. Successive failed attempts to revive it following a miserable period of mis-management in the late 1990s have seen more clentele desert the Duke for the Dartmouth, Lord Palmerston and the Bull. Unsure if the pub is being refurbished or if a chage-of-use is on the way. Will report further when more details known.